Pipeline Risk Assessment in Deep Sea Furrow Regions | Sea Engineering, Inc.
Deep-sea sedimentary furrows have recently been identified as a potentially-significant factor for pipeline risk assessment and route selection. 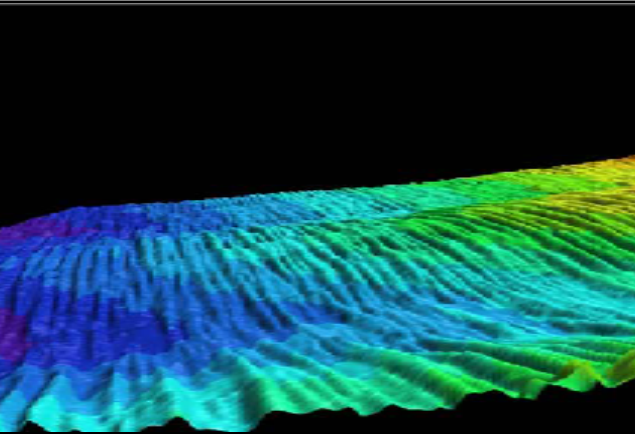 Furrow fields are large-scale variations in seafloor topography which, when coupled with high-velocity bottom currents, can present a significant geohazard to pipelines by creating large spans, flow-induced vibration, and other as-yet-unknown hazards. It is therefore necessary to understand the behavior of the furrow fields and the interactions between pipelines and furrows (at various spatial and temporal scales) so that risk may be characterized and pipeline routes efficiently selected. Data were analyzed and used to develop qualitative and quantitative insights concerning the hydrodynamics and sediment transport within GOM furrow fields. Hydrodynamic and sediment transport models were used to investigate the interactions between a pipeline and deep-sea furrows. Model simulations provided a quantitative method for evaluating the interactions between a pipeline and deep-sea furrows; model results were used to assess pipeline risk within a furrow field.